This combo includes an Aero Precision M5 stripped upper receiver. The M5 .308 Stripped Upper Receiver is the perfect upper for your big bore rifle build. Forged from 7075- T6 aluminum, this stripped upper is precision machined to accept standard .308 components. Match this with our M5 .308 lower receiver for a solid and dependable fit. Featuring M4 Feedramps and laser engraved T-marks. This combo also includes a Noreen 80% LR-308 lower receiver. 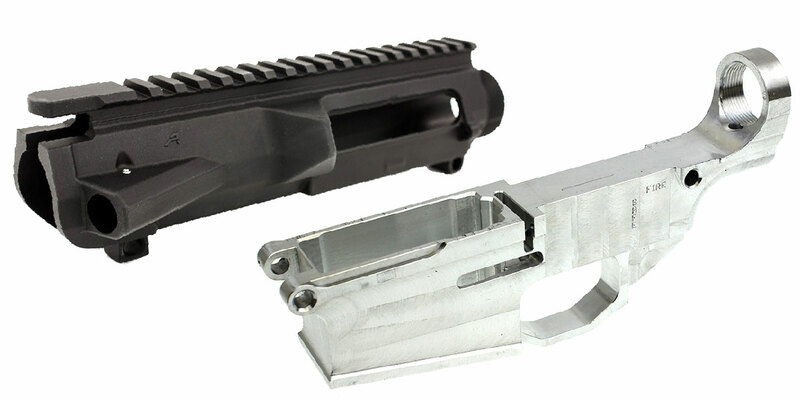 These Noreen 80% Lr-308 .308 lower receivers are made to fit both the DPMS and SR-25 pattern magazines. The receivers carry some of the highest quality features on the market, including: heavy duty trigger guard machined into the lower, reinforced pivot pin and magazine well to aid in loading. Operations left to be completed are: fire control group, trigger pin, hammer pin, trigger slot, and safety selector. This is not a complete receiver and still requires machining to be done. The Lr-308 Pattern is what 99.5% of all of the 308 AR rifles are made from so this 80% lower will work with 99.5% of all of the rifle parts that are 308 on the market today.